Edouard Vuillard, Pierre Bonnard, and a troupe of fellow young artists formed the Nabis—an avant-garde brotherhood that innovated while remaining rooted in the past. This article originally appeared in the May issue of Art & Antiques Magazine as “The Prophets”. In the fall of 1888, in Paris, a group of young friends banded together to form a brotherhood dedicated to new ideas and practices in art. Most of them had studied at the famous Académie Julian and were fed up with its conservative outlook. Like the Pre-Raphaelite Brotherhood before them, they rejected what they saw as the outdated notion of a painting as a portal onto an illusionistic space but found inspiration in the art of the past. Unlike the PBR, this new brotherhood—of whom the Post-Impressionists Edouard Vuillard, Pierre Bonnard, Maurice Denis and Félix Vallotton were the most prominent members—didn’t choose their own name. Their friend, the Symbolist poet Henri Cazalis, bestowed it on them. He called them “Les Nabis,” which means “the prophets” in both Hebrew and Arabic. Perhaps a reference to the exoticized “Orient” (or Near East) was intended; at the time not only academic Orientalist painters but mystically-inclined Symbolists were interested in the non-Christian Near East. Or maybe it was simply that some of the artists were Jewish, most had beards and all were intensely earnest about their mission. Their works, though of course diverse, shared the use of bright or flat colors, compressed or multiple spaces, domestic or everyday subject matter and a sense of symbolic significance that belies the apparent realism. In any case, the name “Nabis” stuck. The group created a private language to go with it, according to which a studio was called an “ergasterium” and letters between the members were to be signed “E.T.P.M.V. et M.P.,” initials standing for a French phrase which means, “In the palm of your hand, my words and my thoughts.” Many of the artists gave each other playful, polyglot Nabi names—Vuillard was “le Nabi Zouave” (Zouave referring to a French North African army unit that wore exotic uniforms); Denis was “le Nabi der schönen Ikonen” (“the Nabi of the beautiful images”); and Bonnard was “le Nabi très japonard” (a made-up term referring to his enthusiasm for Japanese art), while Paul Ranson, at whose home the group first met, was “le Nabi plus japonard que le Nabi japonard.” Obviously, notwithstanding their vaunted earnestness, these artists had a sense of fun. The allusion to Japan in the Nabis’ names referred to the fact that they took inspiration from the Japanese colored woodblock prints (ukiyo-e) that had been flooding into Europe since the middle of the 19th century. This decorative form of Asian art, with its bold, bright colors and largely flat pictorial space, was widely influential; among its enthusiasts was Toulouse-Lautrec, who in turn was a major influence on the Nabis. Like him, the Nabis rejected the distinction between fine and decorative art, and many of them created posters, book designs and illustrations, murals and stage sets for the theater. The avant-garde theater was especially interesting to Vuillard and Bonnard; in 1896 they worked together, along with fellow Nabi Paul Sérusier and Toulouse-Lautrec himself, on the set design for the premier of Alfred Jarry’s absurdist play Ubu Roi—a performance that degenerated into a near-riot due to the obscene and confrontational nature of the actors’ lines—not the set designs. Most of the Nabis’ theatrical work was in the service of less edgy, though still resolutely avant-garde, drama. Vuillard was involved with several theater companies, where he practiced the technique of distemper on canvas, which he later used for easel and panel paintings. In 1891, through their involvement with the theater he and Bonnard were introduced to La Revue Blanche, a wide-ranging cultural journal to which they contributed artwork over the next decade and a half. 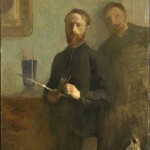 Vuillard especially became close friends with the journal’s publisher, Thadée Natanson, a son of a wealthy Polish-Jewish banking family. 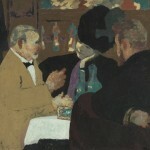 Through Natanson, Vuillard became intimately connected with a circle of patrons and dealers (not to mention muses) who enabled him to achieve financial security by the age of 30 and introduced him to a gracious domestic world that he would depict again and again over the course of his long career, up to his death in 1940. The influence of the Natanson circle on Vuillard is the subject of a monographic exhibition of the artist at the Jewish Museum, “Vuillard: A Painter and His Muses, 1890–1940,” which opens May 4. A Vuillard show in this country is a relatively rare occurrence— the National Gallery in Washington, D.C., mounted a large exhibition in 2003, but the last one in New York was 20 years ago. However, it seems as though a Nabis moment is underway right now, because in addition to the Jewish Museum exhibition, a show titled “Snapshot: Painters and Photography, Bonnard to Vuillard” is on view at the National Gallery through May 6 and then at the Indianapolis Museum of Art beginning June 8. Seeing that career as a whole is a challenge, in that the received art-historical wisdom maintains that Vuillard’s style changed decisively with the turn of the 20th century. 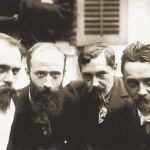 Undoubtedly, most of the Nabis changed their styles and priorities in some way after the brotherhood disbanded in 1899—Bonnard abandoned the city for the south of France, and Denis went on to become an influential theorist of Cubism as well as a religious painter. Vuillard’s work after 1900 has been described as a return to an “optical tradition”—presumably meaning a more conventionally illusionistic representation of space and surface—with the implication that it was a retrenchment into traditionalism. But Brown is at pains to demonstrate the continuity in his work, and points out that even during the Nabi years, Vuillard and his fellow painters were paradoxically both radical and traditional. “The Nabis were the last avant garde who had an unconflictive relationship with the art of the past,” he says. “The change in Vuillard’s work is along the lines of being more naturalistic. He continued to use extreme compositions and colors on occasion, but ultimately he had a goal that goes back to the Nabi period, which has to do with using visual means to convey emotions and meanings. It’s a mélange of realism and Symbolist thinking.” This subtle approach has caused Vuillard to be tagged as a conservative, and in general, the Nabis have been overshadowed in modernist art history by noisier movements such as the Cubists, Fauves and Dadaists. Another paradox of Vuillard was his apparent reclusiveness and actual sociability. True, he never married, lived with his mother until she died and didn’t get involved in politics or public debates. But friendship and personal relationships were essential not only to his life but to his art, and the two had always mixed. 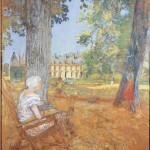 Fellow Nabi Ker-Xavier Roussel married Vuillard’s sister. Artistic associates like the Revue Blanche publishers led him to patrons who became the hub of his quiet though busy social life. “This sociability entailed a circuit of production, material and moral support, and subject matter,” writes Brown. “Vuillard, in effect, became one with his patrons.” In Vuillard’s post-1900 interiors, we see the same intricately patterned textiles that serve in the early paintings to create a spatial background and as an almost free-standing source of visual interest, now repurposed to convey the comfort, serenity and aesthetic satisfaction of a particular social milieu. And the many portraits in the Jewish Museum’s show are reminders of the inseparability in Vuillard’s mind of the artistic and the personal. Vuillard frequently captures his sitters surrounded by their possessions amid carefully depicted décor, playing up the intimate link between people and the things with which they define themselves. In his portrait of the oil-company executive and art patron Marcel Kapferer, Vuillard has in fact painted his own paintings—and one by Bonnard—hanging on the wall behind the sitter, closing the circle by linking his own self to his patron’s sense of self. Given that the Nabis are not often given enough credit for being modern, it is noteworthy that the National Gallery’s exhibition highlights their experiments with photography, the modern medium par excellence. 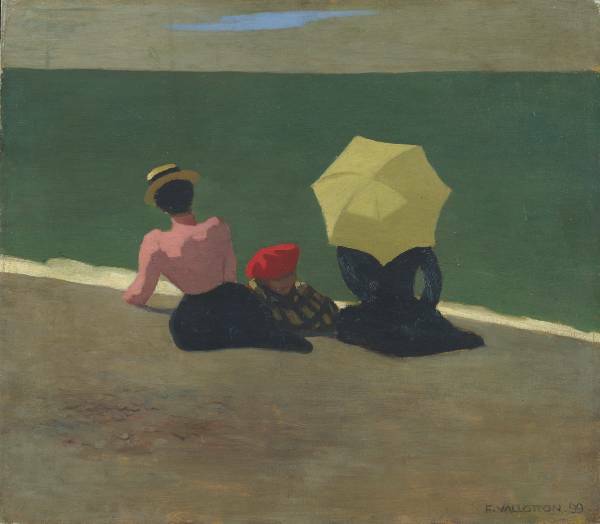 Kodak snapshots of family and friends made by Vuillard, Bonnard, Vallotton and Denis show that the artists approached photography basically as dilettantes, just having fun with the camera like anyone else, rather than deliberately taking photos as free-standing artworks or as raw materials for paintings. Many of the snapshots were technically sloppy, but looking at them with an artist’s eye, the Nabis eventually took inspiration from them with regard to subject and composition. 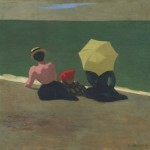 Some famous paintings were clearly modeled on snapshots, especially in the cases of Denis and Vallotton. While some of Vuillard’s photographs ended up being sources for paintings, their main interest lies in the way they frankly and spontaneously record private moments in the life he shared with his intimate circle. We see the Natansons reading together on the sofa in their salon, Lucy Hessel languidly lounging and gazing out a window, the artist’s mother, frail yet smiling, toward the end of her life and—best of all—Vuillard’s brother-in-law Roussel dancing naked in front of a plaster cast of a classical frieze. In this moment frozen in time, the social and artistic cameraderie of the Nabis seems perfectly crystallized.